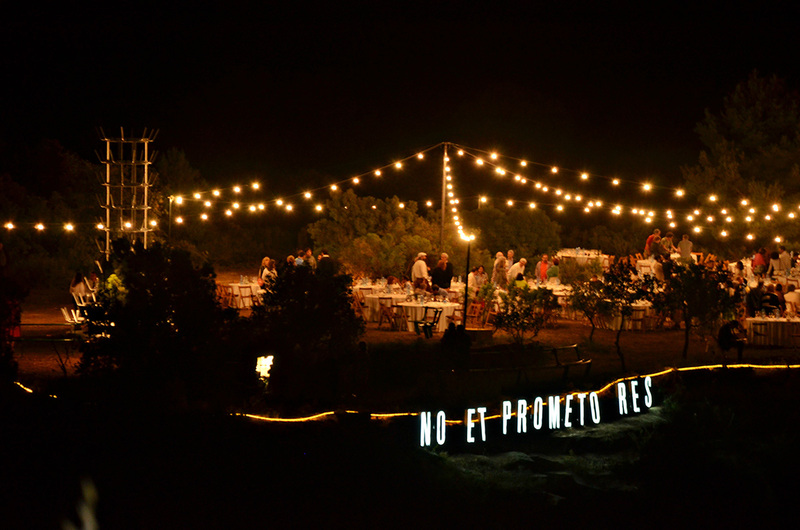 “I Promise Nothing” is a tower, a watchtower, a lighthouse that marks a place where things happen. 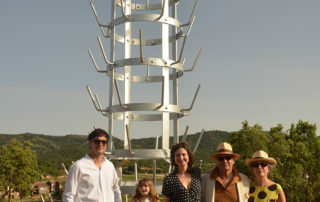 The installation, in a privileged vantage point, consists of several pieces where the sculpture is integrated. 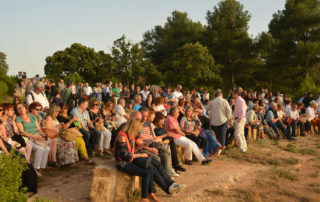 Nearby, the cabin and the abandoned items placed inside -improvised games of children during several generations- have been baptized as “Capella dels Trastos” (Mess Chapel). 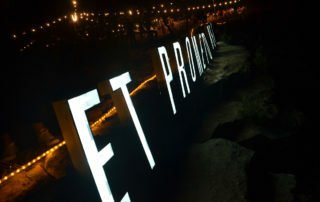 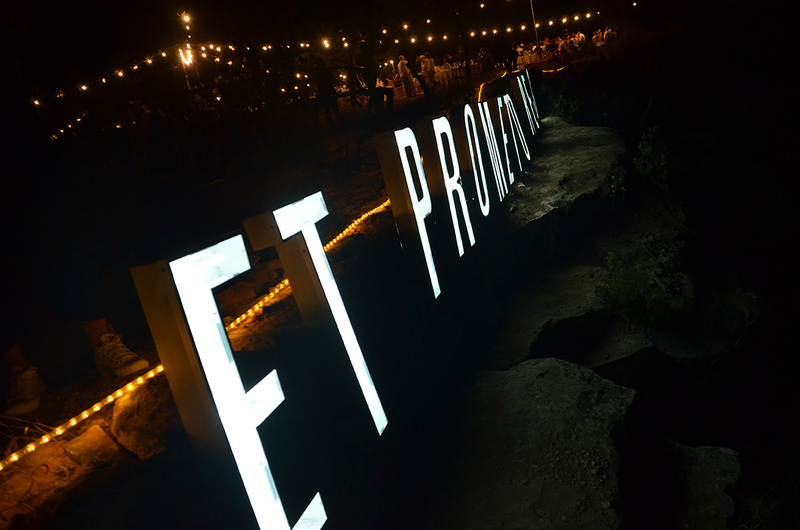 Finally, the inscription of the name of the artwork “I Promise Nothing” in neon nailed to the dry stone that, adding a Hollywood character, evokes certain despair and the urge to live the moment. 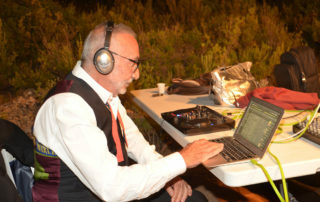 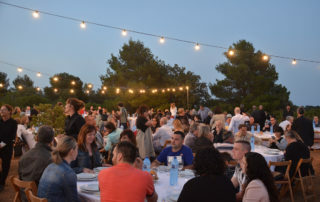 450 people enjoyed a magical night that featured the performances of Lisbon Kentral Café, Manuel Malou and the end of the party of DJ Kuki Keller until dawn. 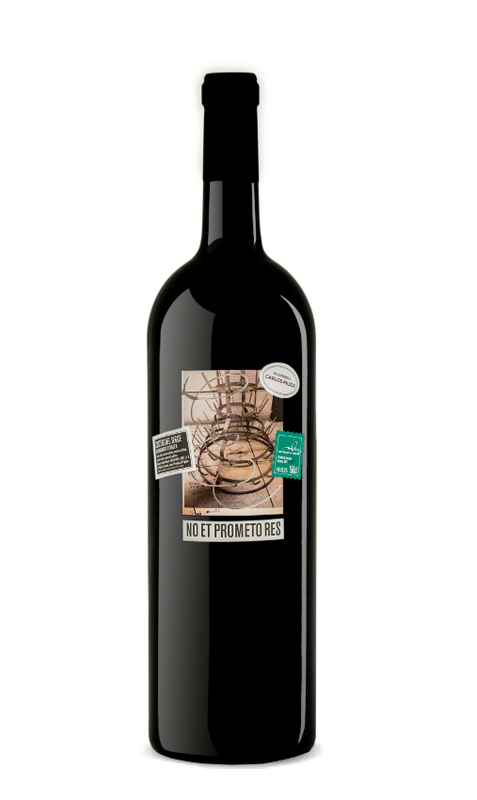 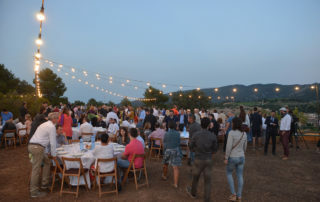 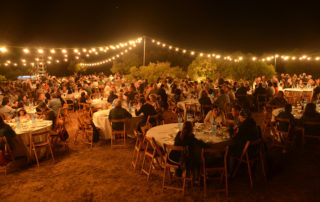 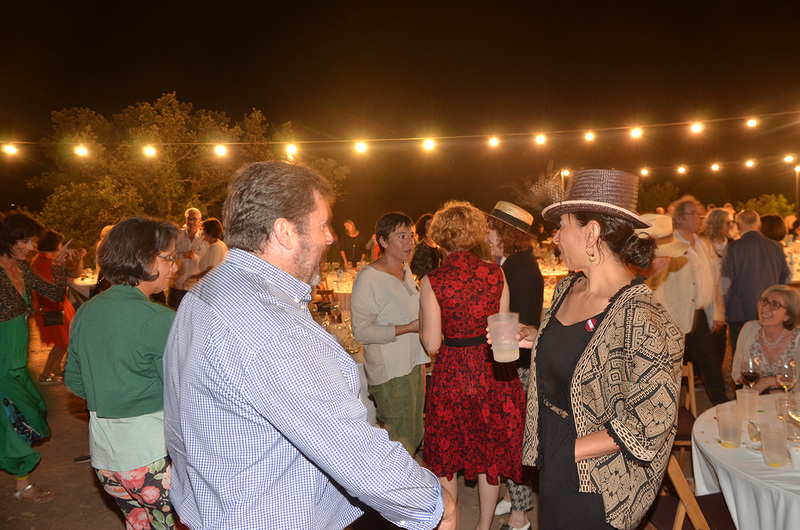 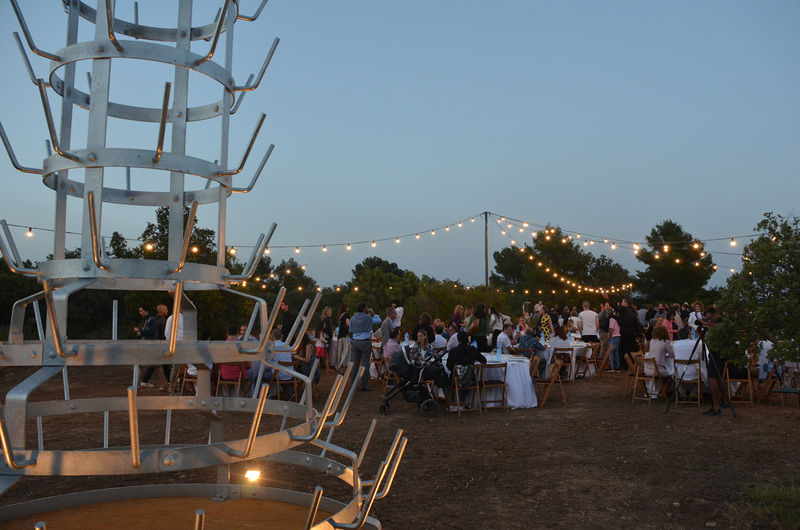 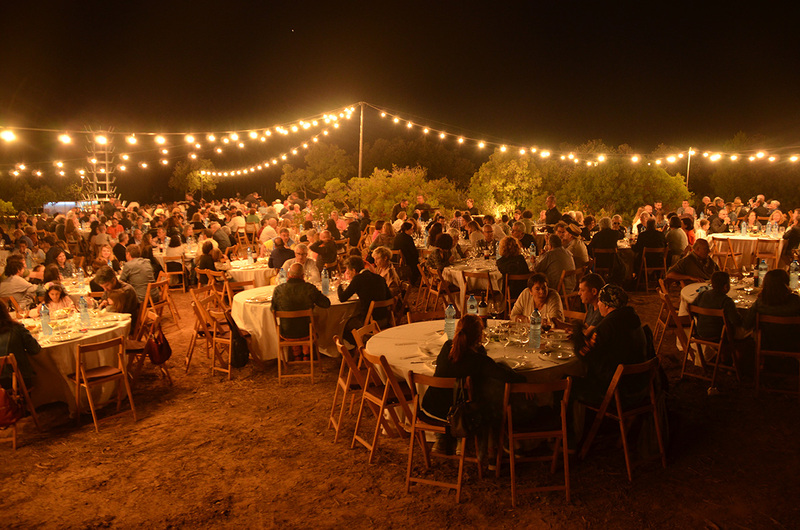 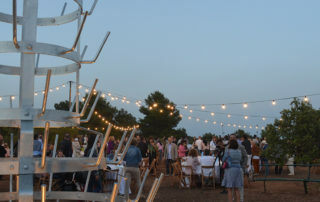 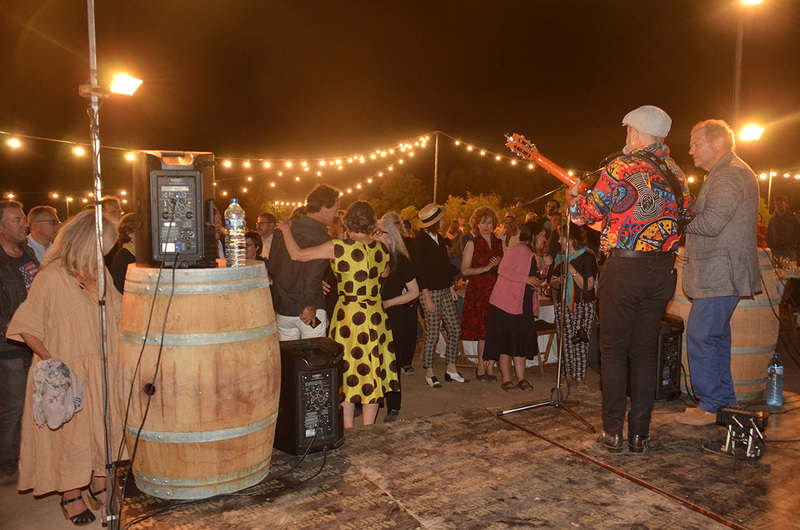 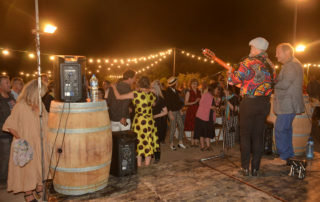 The dinner, under the stars, was paired with the wines Saó Blanc and Saó Expressiu from the winery. 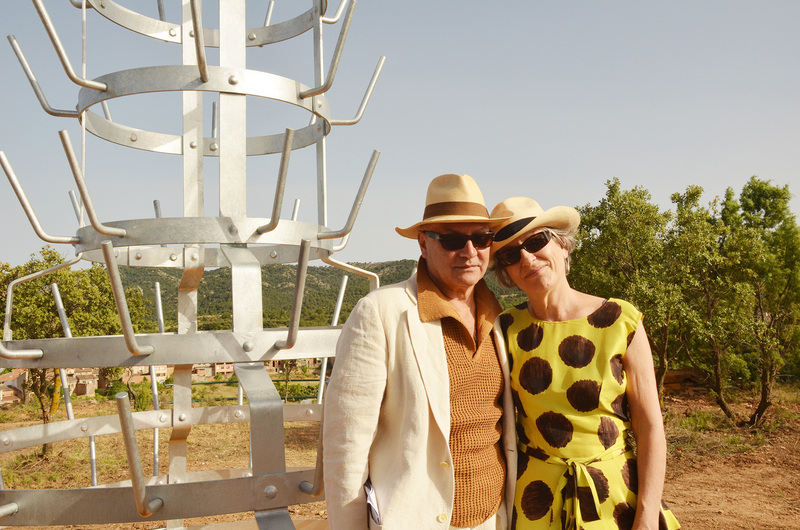 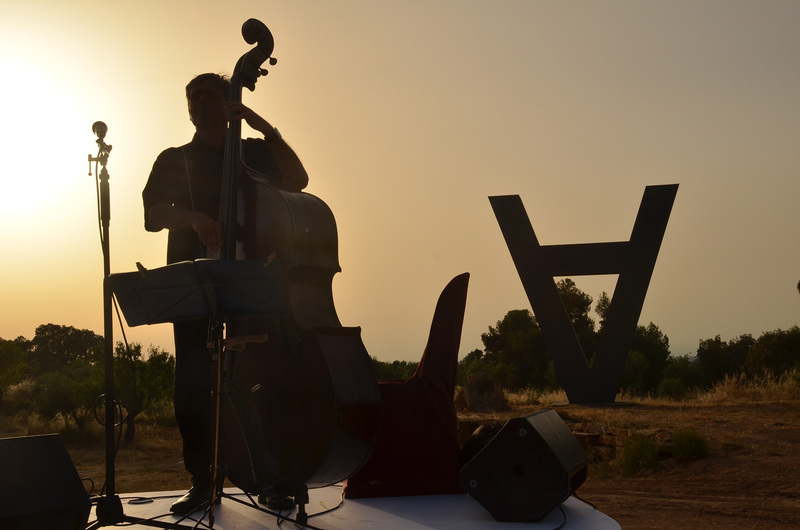 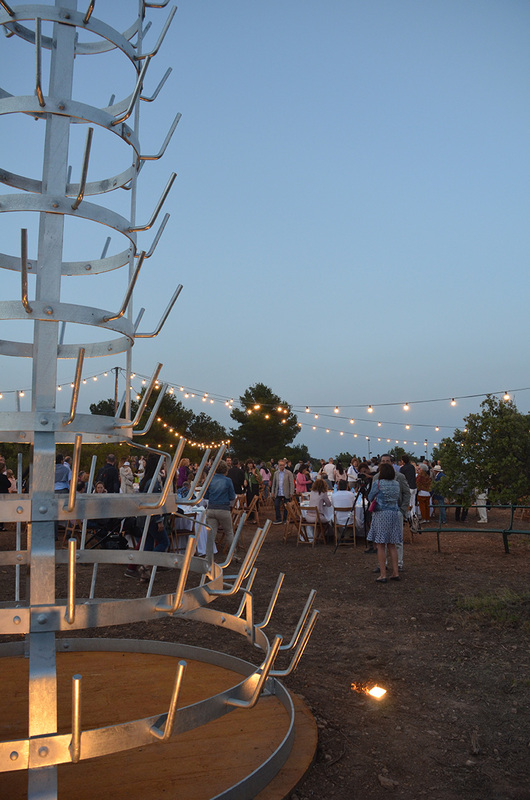 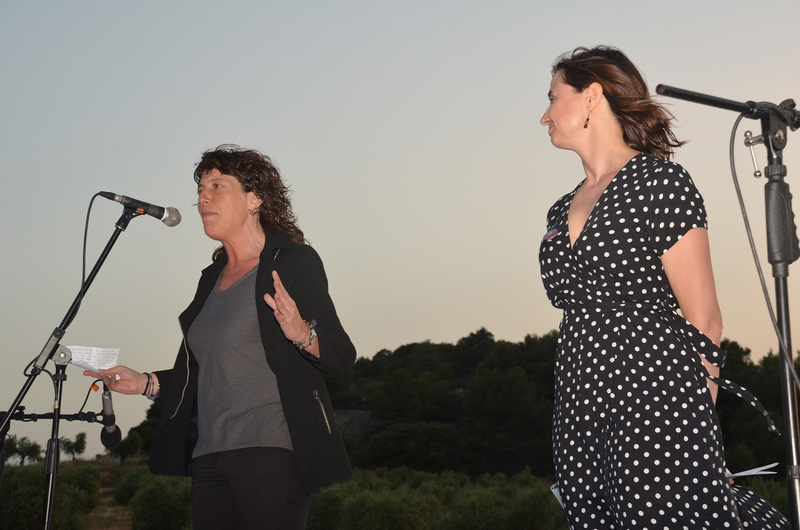 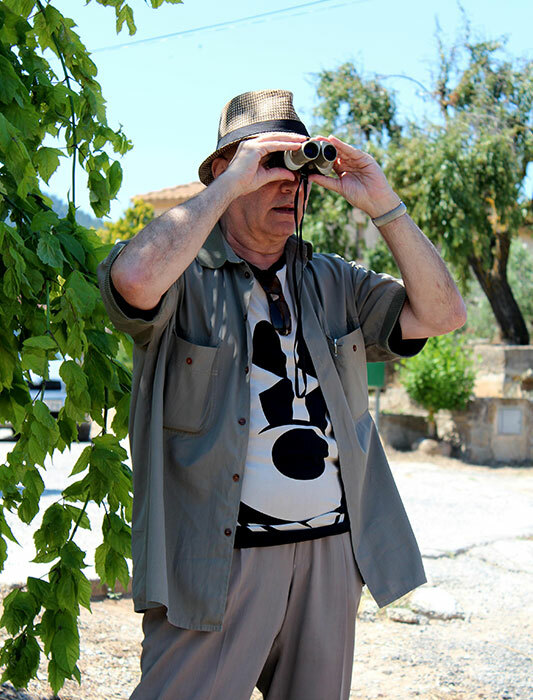 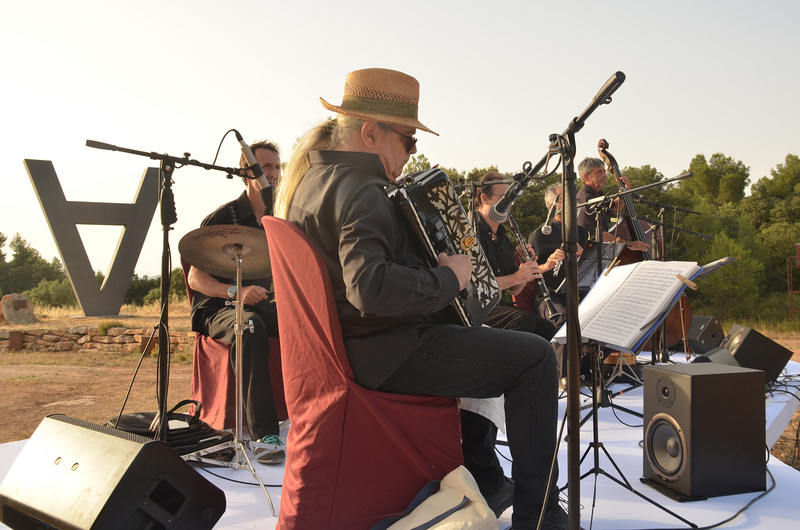 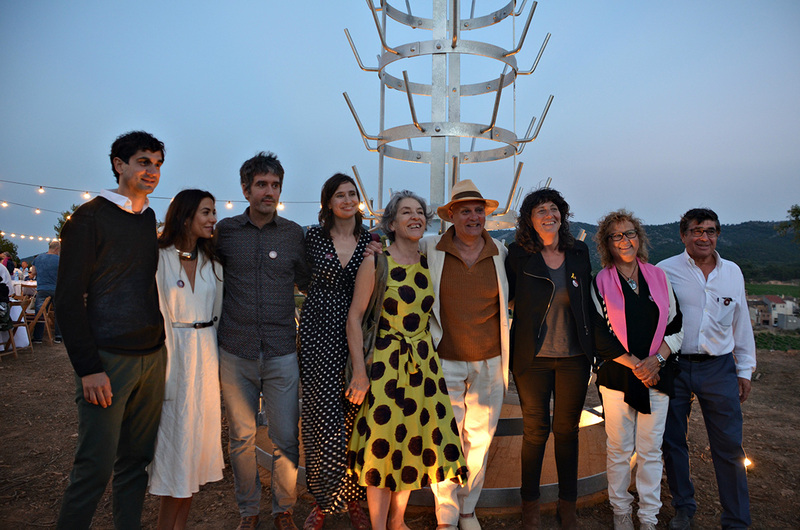 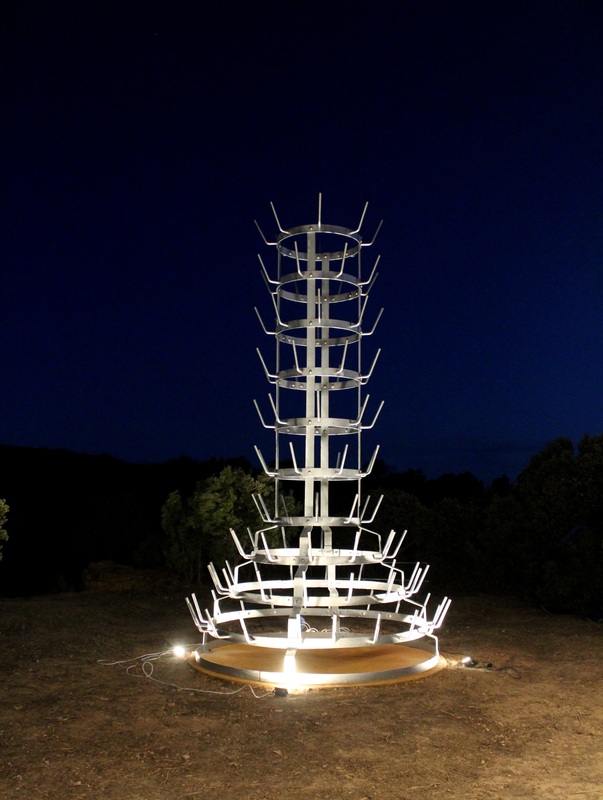 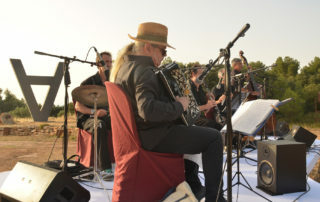 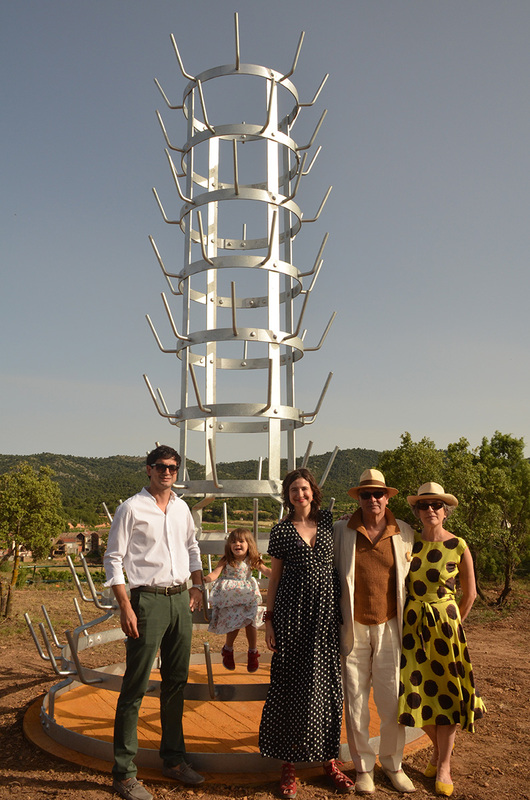 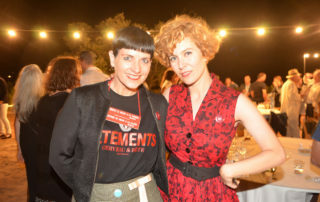 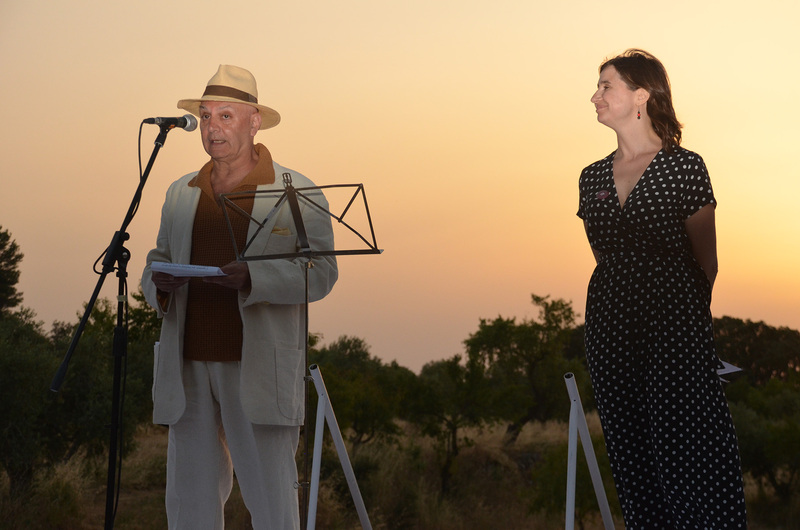 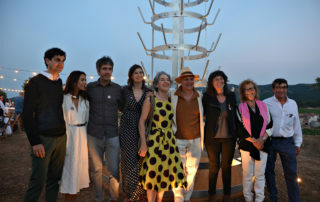 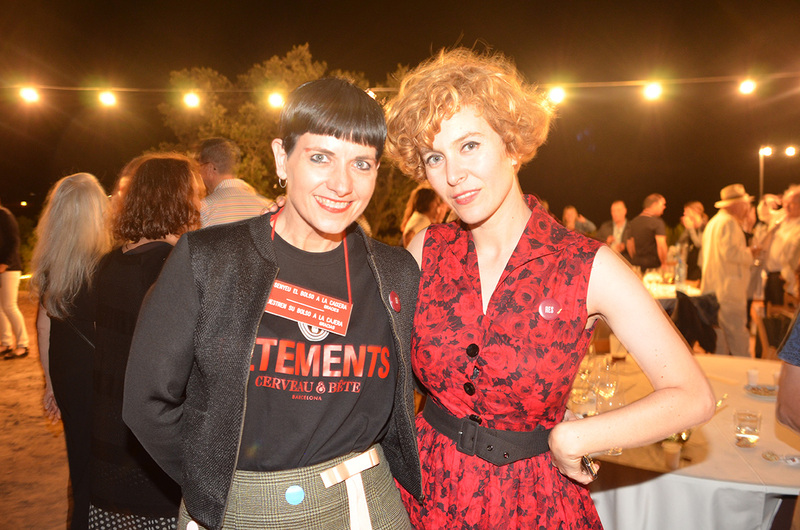 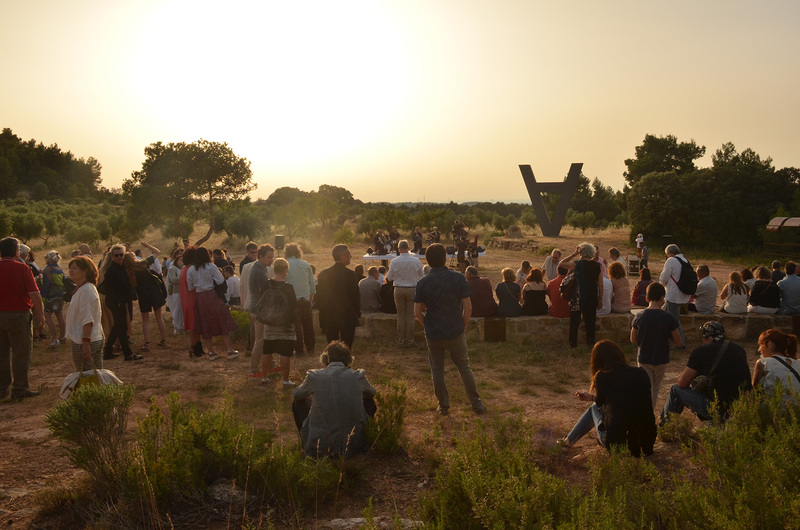 “Accompanied by friends and/or admired artists, this intervention at The Artists’Vineyard allows me to collaborate, and I do it with extreme enthusiasm, in this serious and passionate project promoted by generous, enthusiastic and daring lovers of art and the land”. Opening. 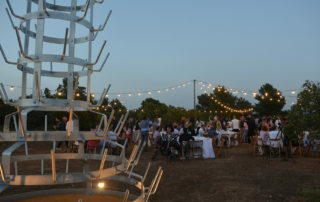 Year 8 party at the Artists’ Vineyard. Pazos had his first solo exhibition in 1970 and his first retrospective, ‘No me digas nada’ [‘Don’t tell me anything’], in 2007 at the MACBA (Contemporary Art Museum of Barcelona) and the MNCARS (Reina Sofía National Art Museum). 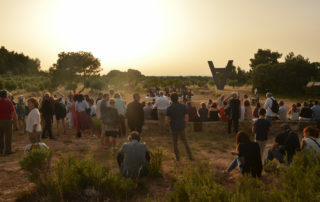 He was awarded the Generalitat de Catalunya’s National Visual Arts Prize in 2008 and the Spanish Ministry of Culture National Plastic Arts Prize in 2004. Carlos Pazos is an undisciplined artist, which allows him to resort to the most appropriate means for whatever he wants to do at any given moment. 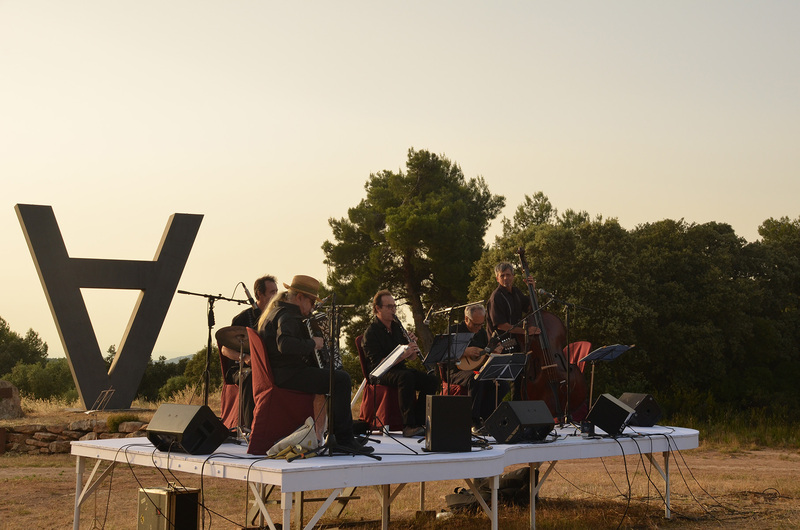 In recent years he has devoted himself, above all, to the cinematographic collage that he has captured in the film ‘Art¡ss!mo’, showed at the MNCARS in October 2015, and which will soon be presented at the Musée Jeu de Paume, Paris. 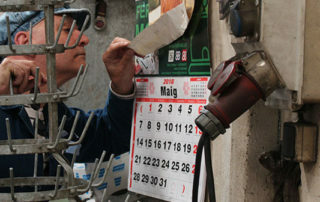 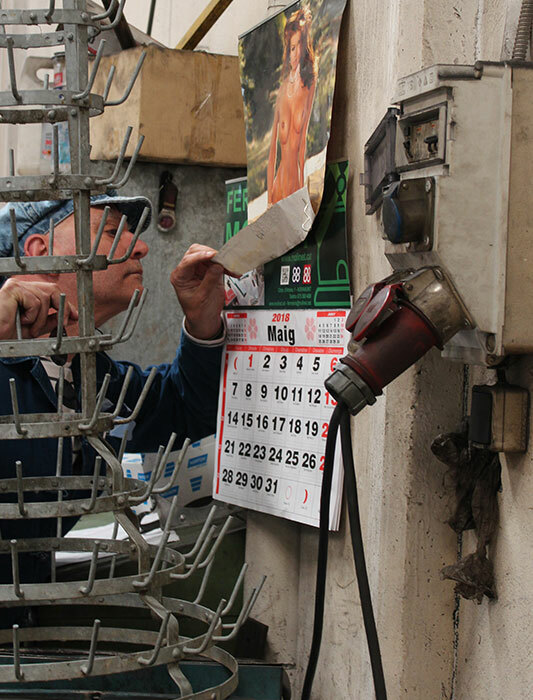 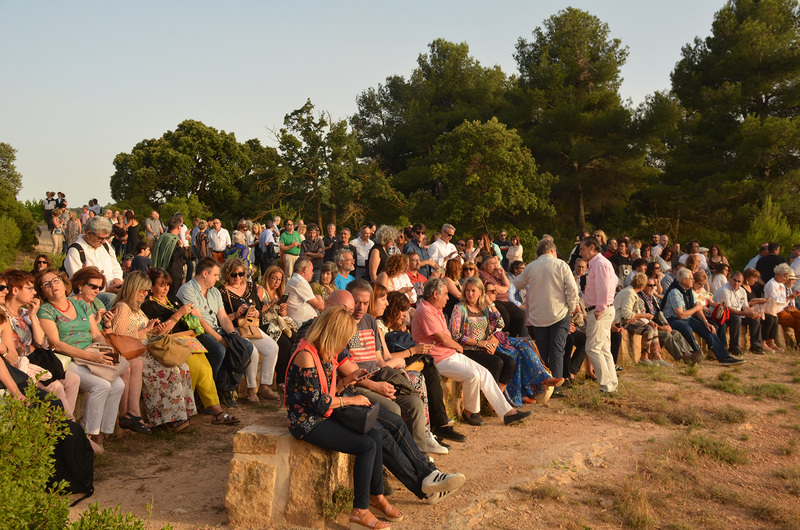 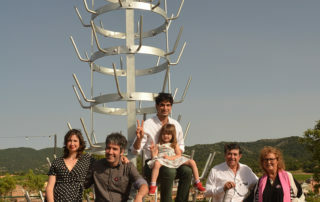 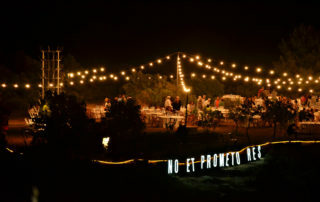 2018 is marked by the installation ‘Out of Limbo’, held at the Santa Mònica’s Art Centre commemorating the 25th anniversary of his exhibition ‘Un elefante en el Limbo’ [‘An Elephant in the Limbo’] at this same Art Centre, and by the making of the piece ‘I promise nothing’ for the Artists’ Vineyard. 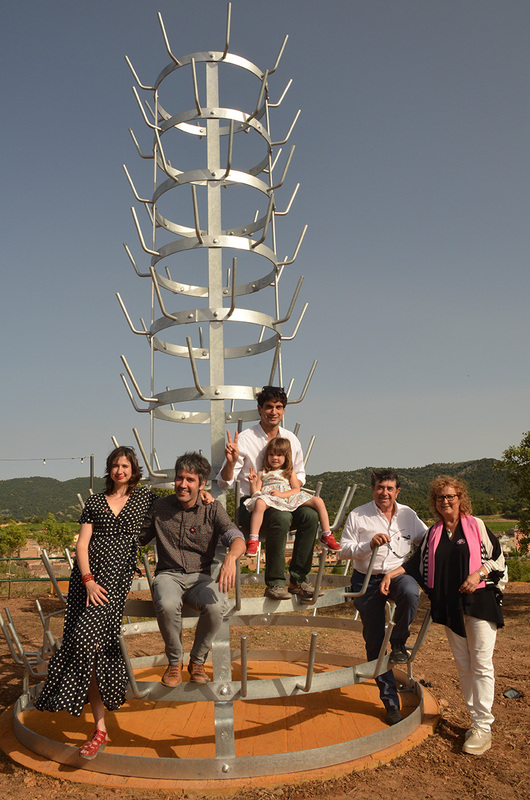 Carlos Pazos has rarely been commissioned to make large pieces for specific places. 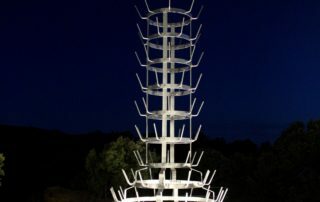 Actually, this is only the second one, after ‘Cupito,…¿y por qué no?’ [‘Cupito,…and why not?’], in 2004, commissioned by the Reina Sofía National Art Museum as part of a year-long celebration of Salvador Dalí. 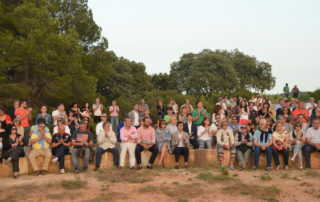 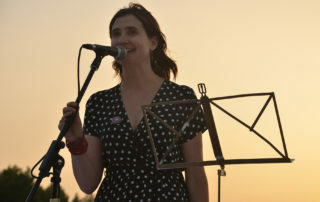 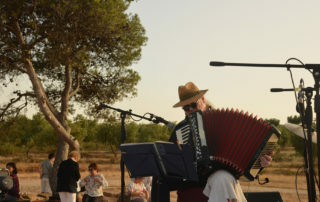 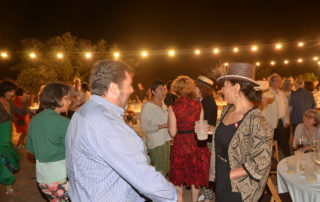 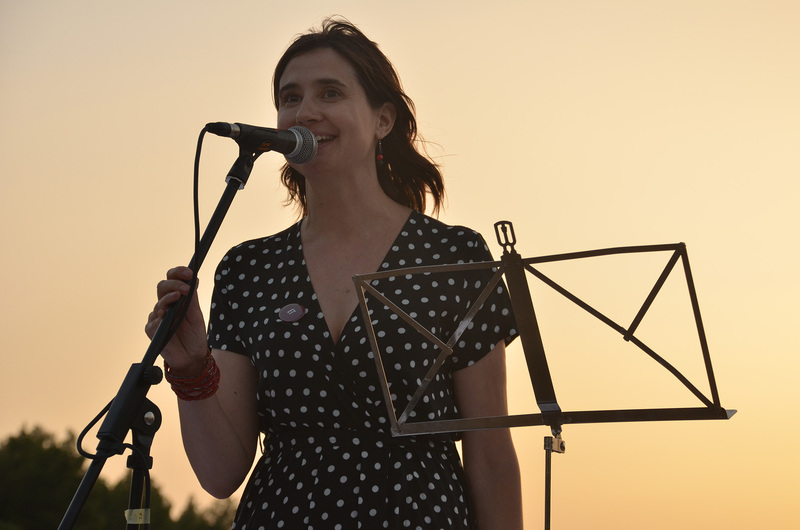 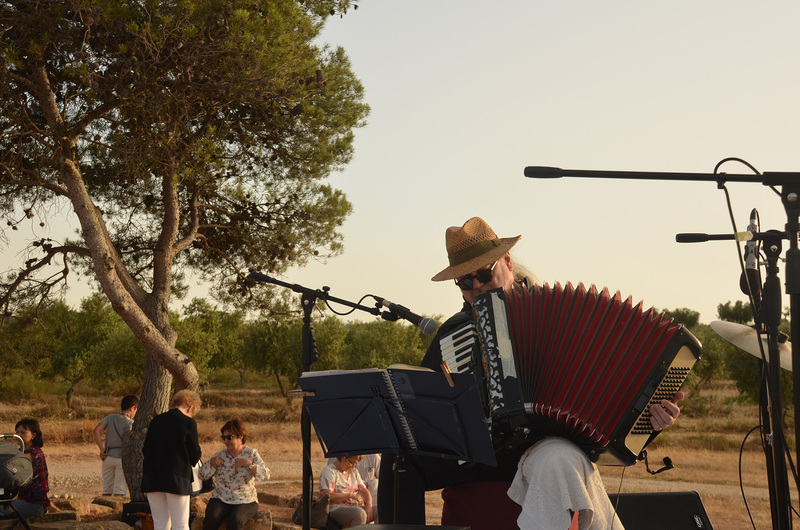 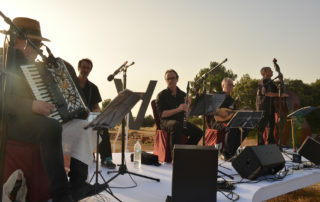 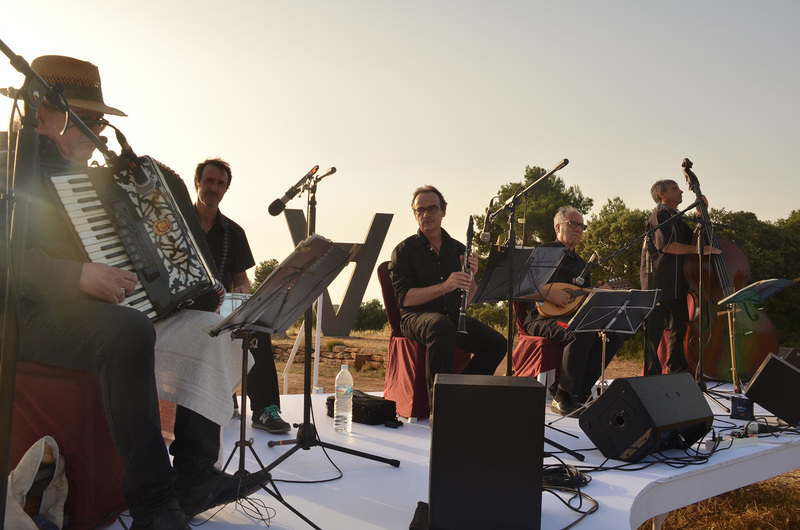 It is currently held by the Antonio Pérez de San Clemente Foundation.